The IBM® Workload Deployer appliance provides a solid foundation for private cloud strategy, enabling the rapid adoption and deployment of both infrastructure and platform as a Service offering. The IBM Workload Deployer uses the concept of patterns to describe the logical configuration of both the physical and virtual assets that comprise a particular solution. The use of patterns allows an organization to construct an individual element or integrated solution one time, and then dispense the final product on demand. Virtual system patterns are comprised of an operating system and IBM software solutions, such as WebSphere® Application Server and WebSphere Virtual Enterprise. Virtual application patterns are constructed to support a single application workload. 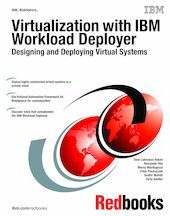 This book focuses on the virtual systems capability of the IBM Workload Deployer and specifically addresses the process of building customized virtual systems that go beyond the standard capabilities of the virtual images available with the product. The book starts by describing private clouds and how they can benefit your business. It introduces the IBM Workload Deployer and its capabilities, and then talks about the various tools that you can use to enhance the process of planning, customizing, and automating virtual system deployment. A sample is used to illustrate how the standard virtual images that are available for the IBM Workload Deployer can be customized for a robust solution that includes dynamic workload management, high-performing data caching, and monitoring of system state. The book then discusses how you can use the IBM Workload Deployer to facilitate the progression of an application through its lifecycle. Finally, an overview is provided of the troubleshooting capabilities that come with the IBM Workload Deployer.